For centuries Jews and Gypsies were exiles, wandering from country to country in search of a safe place to live. Their music – wistful, invigorating, and diverse – still reflects both the difficulties they surmounted, and the various musical styles they picked up in their ramblings. This is why I called this CD “Songs of Exiles”, even if a couple of Jewish songs came from a contemporary Israeli composer. Other Jewish pieces are traditional Yiddish songs and Klezmer dances, while the Gypsy part of this CD draws from the Hungarian violin, Spanish guitar, and Russian vocal traditions. 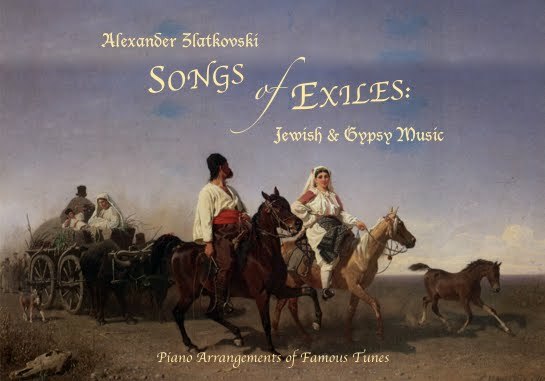 “Songs of Exiles” is mostly a collection of my own piano arrangements. The exceptions are “Czardas” by Vittorio Monti and “Dark Eyes Waltz” by Feodor Herman, where I followed the original compositions, adding only a bit of flourish here and there; and “Asturias” (Flamenco-style Spanish piece by Isaac Albeniz, imitating the Gypsy guitar), where the only change was textural, to make it sound even more guitar-like. All other songs were treated freely; so free, in fact, that they might rather be called fantasies. The music on CD “Songs of Exiles” comes from two concerts with the same name – my most recent addition to the series “Tales from the Keyboard”. Almost every piece has a story. To read some of them, go to my other website www.talesfromthekeyboard.com (don't get surprised: that particular page looks exactly like this one; but you may browse it to find 15 short stories...). To buy CD “Songs of Exiles”, or to download separate tracks (as well as other CDs and digital downloads), click on one of the icons at the bottom of the page.